Now that the swim season is in full swing, I wanted to share a little bit of insight for my friends here. If you have just recently aged out of the “11-12” age group, you are expected to perform better and swim faster and, of course, swim longer races. This means you have a few short weeks to polish up your stroke and improve your endurance before your first meet. You won’t be able to swim the 50 Fly anymore, kiddo. Welcome to the big kid pool. But don’t be afraid of it. The 200 IM isn’t that bad. Think about it this way, you swim plenty of 200 IM’s in practice, so why can’t you do it once in a swim meet in which you are well-rested and full of energy? I had a terrible mentality about the bigger races when I aged up. I used the excuse of injury to switch to a breaststroker in hopes that I would altogether avoid doing the 200 IM! I was by no means great at the Breaststroke, but I figured if I got better at it, I wouldn’t have to swim the Butterfly. But in my heart, I was a true Butterflyer. Ever since I was 9, it’s been my stroke. (See pic of me many years ago) So what ended up happening? 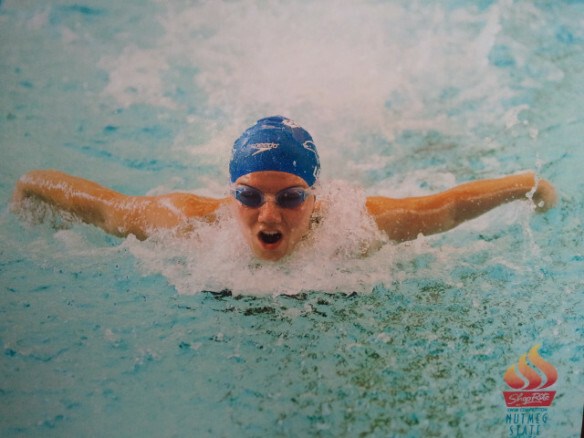 Well, I was already good at the fly and the free, and my breaststroke was forced to improve because of injury, so that left Backstroke. Still, I didn’t want to do the 200 IM. Then, for the sake of the long, boring meets and watching everyone else do it, I decided to enter into the 200 Meter IM. Truthfully, I loved it. It’s now one of my favorite events to swim. Everyone’s going to have their strengths and weaknesses. We’re all going to have to train harder to fix those weaknesses. But how can you find what your weaknesses are if you’re too afraid to try the task? A chef won’t be able to realize that his nachos aren’t spicy enough if he’s too afraid to make nachos in the first place. Similarly, a chef won’t realize how amazing his nachos are if he’s nervous about how they’ll turn out! Don’t be like the nacho chef. Do the 200 IM. If you find yourself falling behind on a certain stroke, you now know what you have to work on! Then, guess what! You’ll drop time. You’ll win. You’ll feel stronger. Your age won’t matter anymore.